Children in the primary grades enter a stage of life brimming with wonder, awe, curiosity and energy. At Peninsula, children generally ages 5–9 are grouped in classrooms to enhance their social, emotional and cognitive development. Here they begin to exercise more independence and make choices within a more sophisticated framework of available activities. They can now choose exciting activities of interest to them outside the classroom, such as science in a lab, math in the math room, art, library, woodshop, clay, weaving, and music in their respective studios. In addition to abundant active free play throughout our beautiful campus, physical education on the playing fields or in the indoor playspace is provided. The first overnight camping trips are held, children take responsibility for work jobs in the broader school community, and daily class meetings become even more important in the development of each child and the class as a community. Academically, we consider skills in reading, writing, and math as vehicles to further intellectual curiosity and independence. Our teachers create dynamic learning experiences that focus on developing cognitive flexibility, social and cultural fluency, collaborative inquiry, precision of thought and persistence. Hence, the youngest children are taught the skills to learn how to read, opening the door to becoming more independent readers and learners. Peninsula's teachers are uniquely attuned to each child's intellectual development. Because children work at individual paces, teachers monitor progress and assess needs while engaging children with ideas and questions, encouraging and assisting each child to greater independence in their intellectual growth. "Reading, writing and math are approached from a number of perspectives: they are woven into class projects and learning activities, and they are presented through games, manipulatives, and other experiential ways of learning both in the classroom and in the studios. In the Primary classrooms, teachers guide inquiries into mathematics through hands-on experiences which enable children to explore, question, reason, construct meaning and problem solve. It is in this way that students experience math as a living discipline. Play-based classroom experiences and teacher-curated resources follow children's interests in building with blocks, cooking, quilting, measuring and graphing, inspiring children to make sense of the math in their everyday lives. These experiences support a deep understanding of patterns, encourage acquisition of number sense, and foster connections and interpretation of data as the foundations of high level math cognition. Reading and writing activities find children in small groupings engaged in a variety of activities ranging from writing in personal journals, reading individually selected books, working in self-paced practice books, and enjoying activities created with their specific interests and needs in mind. Assistant teachers support head teachers (some classes have two assistants), and a reading and writing specialist has regular sessions with each class, providing generous attention to each child and a high level of support for the teachers. Parent volunteers also provide 1 : 1 reading practice time in classrooms. Class meetings, held every day, may appear simple but a close study reveals children engaging in social democracy, finding their voice, learning how to resolve conflicts, and experiencing viscerally the balance of individuality, diversity and community. It is here, while sharing, discussing a disagreement on the playing field, choosing and planning class activities, producing a play, or sponsoring a carnival, that children learn to be confident contributors, ethical leaders and compassionate citizens. I really love that kids get to be kids." 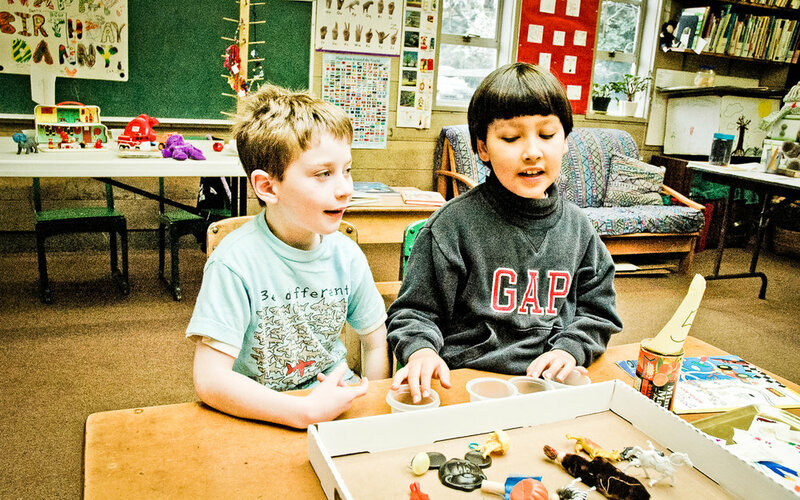 Beginning in the K–1 class, children choose the activities they participate in outside of the classroom including art, woodshop, clay, weaving, music, library, math and science. These classes occur each day for one hour. 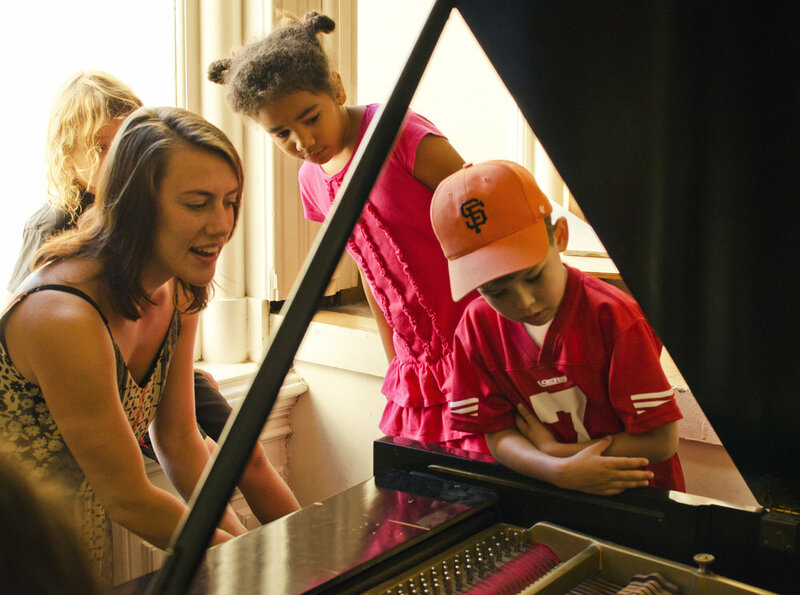 This is one way that children learn how to make choices based on their affinities, where they learn about taking responsibility for their choices, and where they discover passions and interests that may last a lifetime. An integrated day allows children to learn and develop skills through a variety of approaches, allowing children to naturally construct meaning. In this way, learning becomes a part of children, fosters deep understanding, and connects children to the world around them.